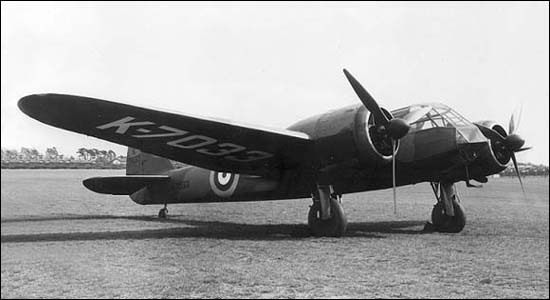 The Blenheim was originally developed from the Bristol civil transport plane. At that time, it was faster than most existing RAF fighters when it was first tested in 1935. The RAF took delivery in 1937 of the MK I and the MK IV in 1939. The MK I was mainly used as a light bomber and the later Mk IV used as a light bomber, night-fighter and reconnaissance plane. The Blenheim was fitted with retractable landing gear, and had a crew of a pilot, a navigator/bomb aimer, and an air gunner/radio operator. The advantage that the Blenheim had over similar aircraft was it's range. It could penetrate deep into enemy territory, but with only a top speed on 263 mph and slow in turning, daylight losses was a cause for concern for the R.A.F. It was then decided that the Blenheim would be used mainly for night fighter duties.